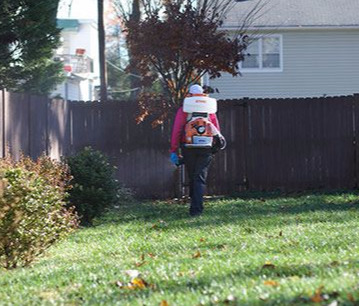 Let us get your lawn healthy & green with less pesky insects with our Lawn Care Services. 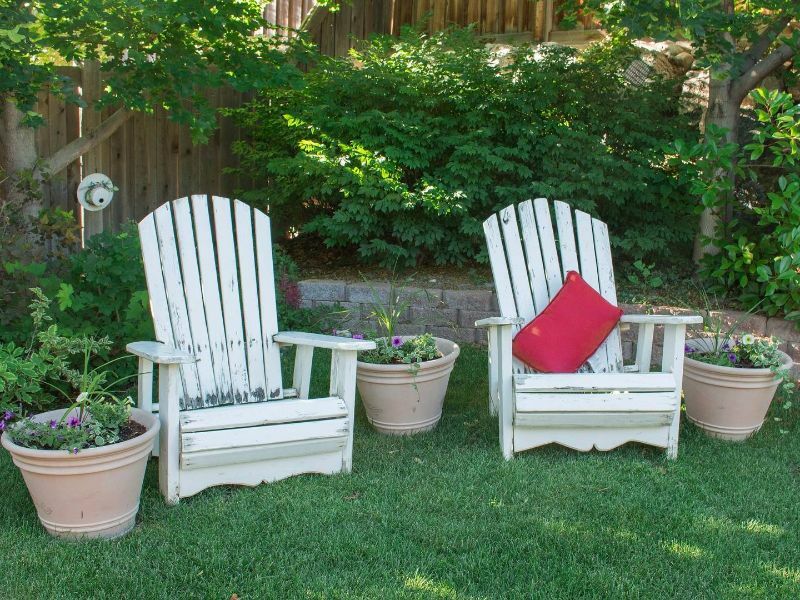 Enjoy your yard without the pests. We are a local company with over 25 years experience providing the highest quality State Licensed Lawn Care to the Mahoning Valley in Northeastern Ohio. Areas serviced include Canfield, Boardman, Poland, Austintown, North Lima, Salem, Columbiana and surrounding areas. 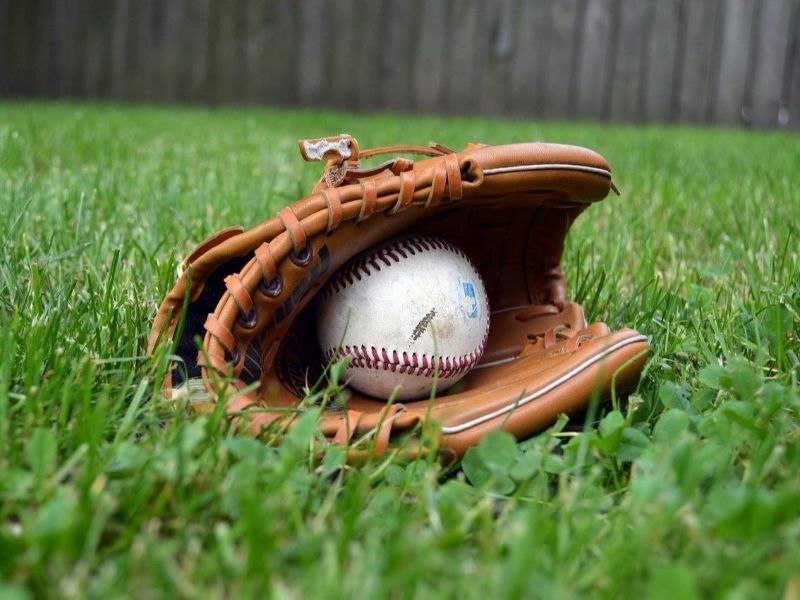 We only use professionally custom-blended granular fertilizer formulated to be effective for our Northeastern Ohio lawns. Get a healthier, thicker lawn by removing small plugs of grass, soil and thatch to create a channel for your lawn to regenerate deeper grass roots and a place for new grass seed to thrive. Get rid of the pests in your yard with our Grub Control Application or our Flea & Tick Control Application. Let us get your lawn healthy with less annoying insects with our Lawn Care Services. Professional Lawn Care can cost less than you think compared to doing it yourself. We have the professional equipment, access to commercial grade products and the skilled expertise to diagnose, treat and apply the correct product, at the correct time, with the correct application rate. We also have the power to buy the highest quality commercial grade products in bulk to then pass on the savings to you. In the long run it is often more cost-effective to hire a trained pro with expertise to get the results you want the first tme than to mess around with do it yourself lawn care. With one less thing to worry about you will have more freetime to enjoy your healthy green yard with less annoying inscects. 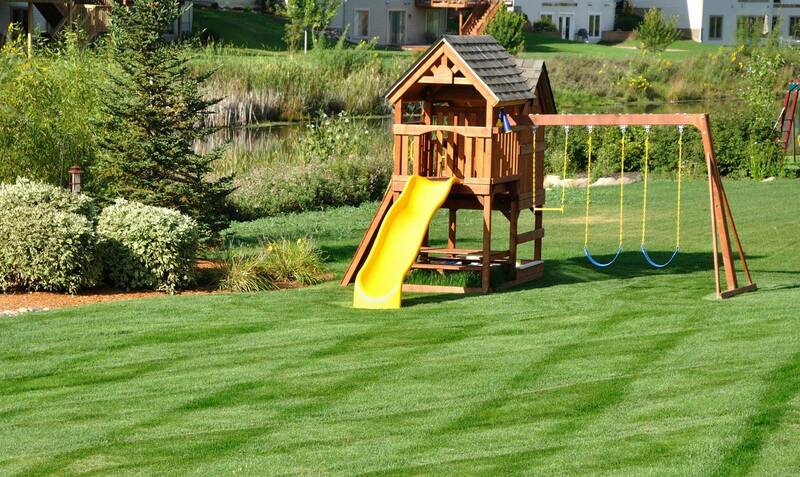 We have the professional knowledge, experince & equipment to get your lawn healthy & green. Our Zspray Lawn Care Machine is calibrated & set to apply the correct application rates for the product being used. Why spend a week walking around your lawn with DIY aeration shoes when we have the proper professional equipment to get it done correctly. Our Zplug Aeration Machine can Aerate & Overseed your lawn in one step. We buy our commercially available professional grade lawn care products in bulk & pass the savings on to you. Buying the consumer lawn care products & doing it yourself can end up costing you more in the long run. Doing it yourself can be challenging to get it right. 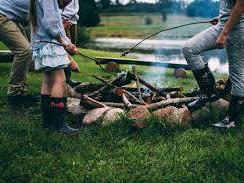 We have the expertise & equipment to get the results you want leaving you more freetime to enjoy your healthy green yard with less pesky biteing insects. 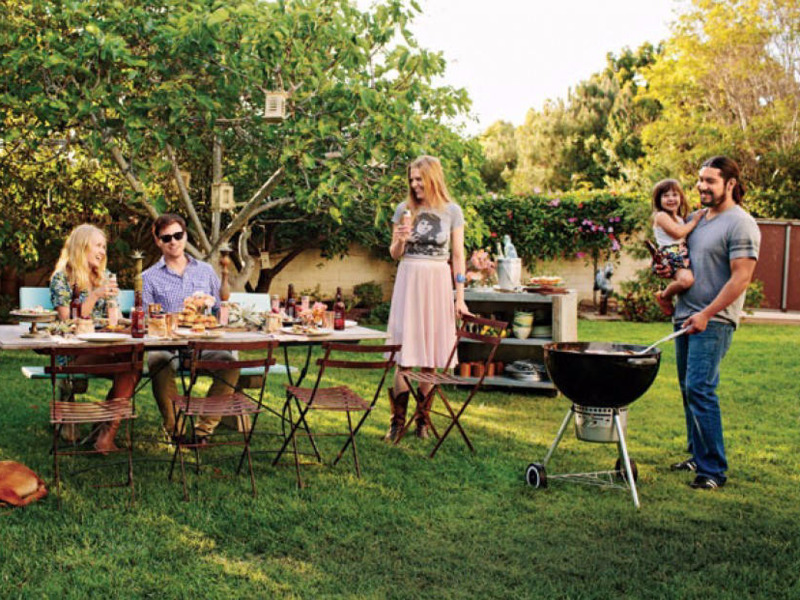 HOW ARE YOU GOING TO ENJOY YOUR YARD? Let us do your lawn care & insect control leaving you more freetime to enjoy your yard. We only use professionally custom-blended granular slow-release fertilizer formulated to be effective for our Northeastern Ohio lawns. We have found that granular fertilizer performs much better than the liquid fertilizers often used by some other “spray” companies and we have the results to prove it. APPLICATION 1 -AWAKEN- The Early Spring application will promote spring green up & recovery from winter stress with a balanced granular slow-release fertilizer. We apply a pre-emergent to help prevent crabgrass from germinating & broadleaf weed control for any weeds that have emerged. Landscape Bed Weed Control should be added to this application. 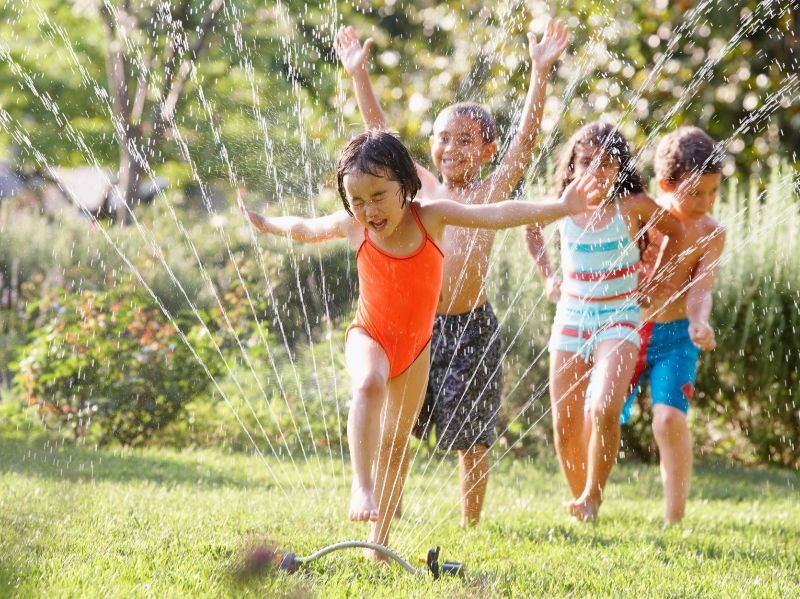 APPLICATION 2 -THRIVE- The Late Spring/Early Summer application will help your lawn maintain the lush green color & prepare for the stress of the hot summer with granular slow-release fertilizer. 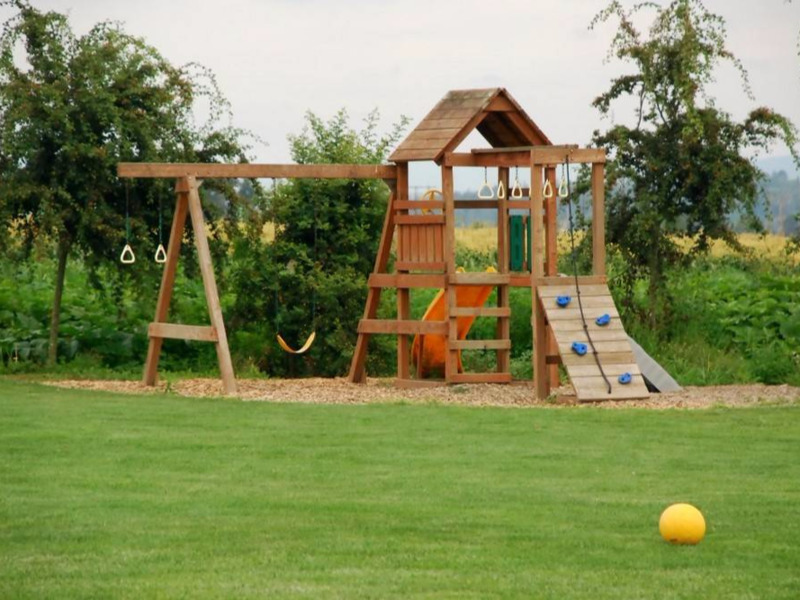 A Surface Insect Control treatment will be applied to control lawn damaging insects. Broadleaf weed control will also be applied.Tick Control Treatment can be added to this application. Lawn Tick Control Treatment can be added to this application. APPLICATION 3 -SUSTAIN- The Summer application will provide the nourishment to help your lawn fight drought & disease stress during the hot, dry summer with granular fertilizer. Broadleaf weed control will be applied as needed. Grub Application can be added to this application. APPLICATION 4 -RECOVER- The Late Summer/Early Fall Application will continue to feed & maintain your lawn to encourage recovery from summer’s stresses with granular fertilizer. Broadleaf weed control will be applied as needed. Landscape Bed Weed Control should be added to this application. APPLICATION 5 -REGENERATE- The Fall application will use a balanced granular fertilizer to stimulate root regeneration to prepare for winter & promote a healthier, greener lawn in the spring. Broadleaf weed control will be applied as needed. Lawn Aeration & Overseeding should be done in the fall. by adding on additional services. Stop the life cycle to help prevent Grub problems before they start. 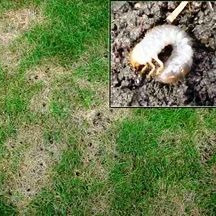 Grub Control helps to stop the eggs from developing into the damaging, hungry grub larva that feed on your grass roots. Grub Control is applied in the summer when the eggs are present before they develop into larva. For such a little insect, Grubs can cause a lot of damage. 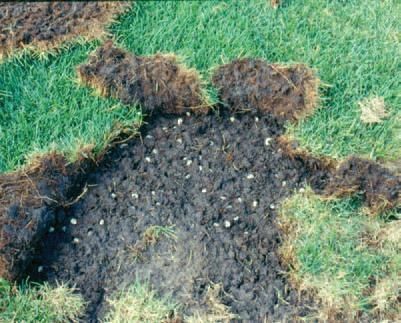 Grub Larva feed on grass’ roots, causing large patches of turf to wilt or die resulting in a patchy brown lawn. Then overnight raccoons and skunks come along and dig up your lawn looking for grubs to eat making your lawn look even worse. Timing is everything to stop the life cycle. Grub Control helps stop the eggs from developing into the damaging, hungry grub larva that feed on your grass roots. To be effective Grub Control is applied in the summer when eggs are present before they molt into larva. Grub Control can be added to Application 3 of our Weed & Feed Lawn Care Program. Enjoy your yard without ticks. The Center for Disease Control recommends spraying your yard for ticks to help prevent Lyme and other dangerous diseases. 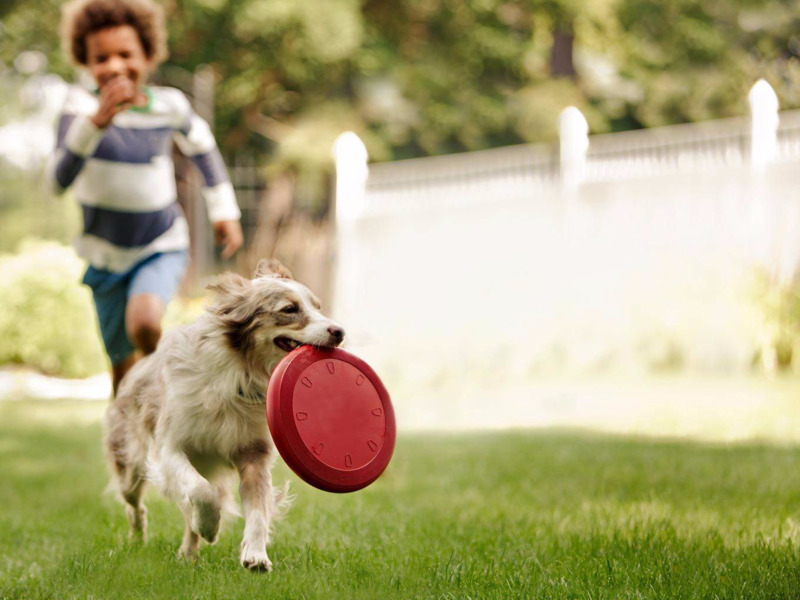 Adding Tick Control can help reduce ticks in your yard that may be carrying Lyme disease. Provide an extra layer of projection in your yard. Don't just treat your pets for ticks, treat your yard also. You love your fur babies. Provide an extra layer of projection in your yard. 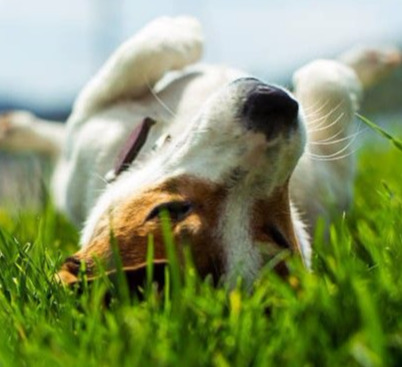 Why just treat your pets when you can also treat for Ticks at the source, your lawn. The (CDC) US Center for Disease Control recommends treating your yard for ticks to prevent Lyme and other dangerous diseases. There is a rise in Lyme disease in Ohio with cases reported right here in our Mahoning Valley. In 2007, there were only 33 human cases of Lyme disease in Ohio. In 10 years the number went up 8 times with 264 cases of Lyme disease in 2017 as reported by the Ohio Department of Health. The rise in Lyme disease is a concern with already over 1000 confirmed cases of Lyme disease in the past 10 years in Ohio. 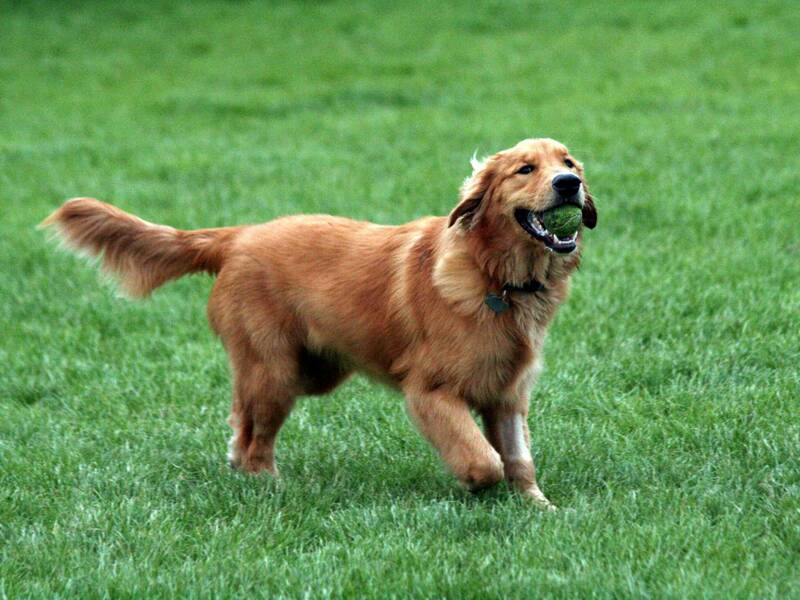 Adding a Tick Control Application can greatly reduce the number of ticks in your yard. Blacklegged ‘deer’ ticks are active throughout the year in Ohio. The adults are active in the spring, fall and winter. The nymphs are active in the spring and summer and the larvae are active late summer. The onset of human Lyme disease cases occurs year round in Ohio but peaks in summer following the emergence of nymphs. (Source: ODH, Zoonotic Disease Program). To control Ticks, applications should be made in mid to late spring to control larvae and nymphs that reside in the soil and leaf litter. Tick Control can be added to Application 1 or Application 2 of our Weed & Feed Lawn Care Program. Have an outdoor event coming up? Mosquito Control Applications help reduce the number of mosquitoes and other insects around your house. Contact us in advance to schedule sevice. Mosquitoes need standing water to breed. Along with Mosquito Control Applications, Mostquito habitats need to be removed. Enjoy your yard more with less annoying pests. Mosquito Control Applications also helps control fleas, stink bugs, ants, gnats, biting flies and other insects. Mosquitoes are not only annoying but may transmit diseases such as West Nile Virus to humans or transmit heartworm in dogs. Help reduce the number of mosquitoes and other insects around your house with a Mosquito Control Application that can last up to 45 days. Also helps control fleas, stink bugs, ants, gnats, biting flies and other insects. Remove Mosquito habitats along with Mosquito Control Applications. Mosquitoes need standing water to breed. First start by removing breeding habitats that hold standing water such as tires, toys, wheelbarrows, tarps, buckets or any place where water can collect and be retained for 7-10 days. Empty and change the water in bird baths, fountains, pet bowls, wading pools, rain barrels, and potted plant trays at least once a week to destroy potential mosquito habitats. Mosquito Control Applications will then help manage the adult biting Mosquitoes. 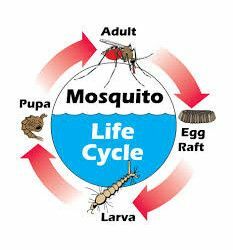 Mosquito Control Applications treat the resting sites of the Adult Flying Mosquitoes. During the day Mosquitoes rest in moist, shady areas including the undersides of your ornamental landscaping plant leaves and under decks or eves. Less Mosquitoes equals less bites. Help reduce the number of mosquitoes and other insects around your house with a Mosquito Control Application that can last up to 45 days. Also helps control fleas, stink bugs, ants, gnats, biting flies and other insects. 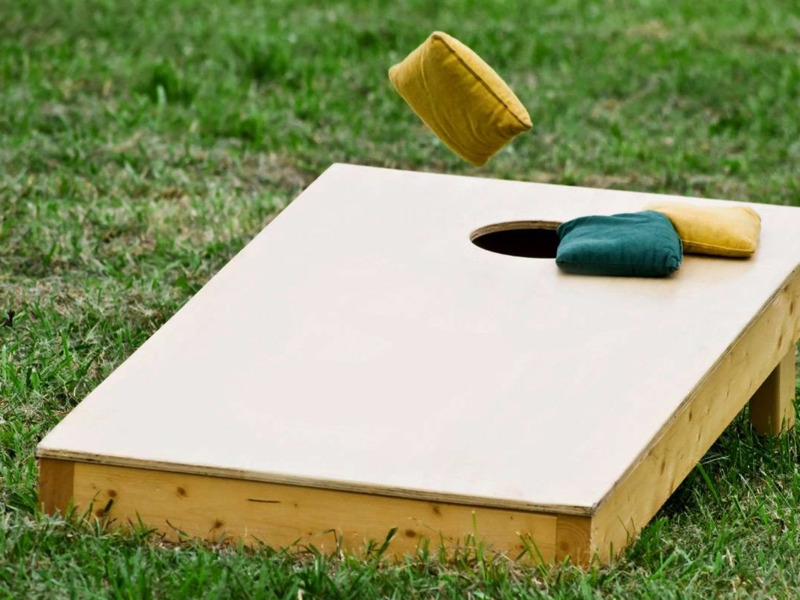 Have an outdoor event coming up? Contact us in advance to schedule service to reduce the number of mosquitoes and other insects around your house. Stop the weeds before they happen. Pre-emergent weed control prevents the weed seeds from germinating. It needs to be applied in the spring and in the fall to be effective. Stop the weeds before the sprout. Weeds don't have a chance to grow when applied before weed seeds germinate. Greatly reduce the need to hand pull or spray weeds if applied before the weed seeds sprout. Stop the weeds before they happen. Using a Pre-emergent herbicide is the most effective way to control weeds before they germinate. The commercial Pre-emergent herbicide we use for Landscape Bed Weed Control effectively controls of more than 125 broadleaf and grassy weeds. Timing is everything to control weeds. Pre-emergent weed control prevents the weed seeds from germinating. It needs to be applied in the spring and in the fall to be effective. It is much easier to prevent the weeds before they pop up than to get rid of them after by spraying weed killer or pulling them by hand. Using a pre-emergent herbicide during the spring and fall is a very effective and efficient way to prevent weeds from ever happening. The Pre-emergent herbicide we use for our Landscape Bed Weed Control soaks into the soil and creates an invisible barrier that prevents weed seeds from germinating. It can't however help weeds that have allready sprouted and those weeds will have to be sprayed with a weed killer or pulled by hand. When plugs are left on the surface and allowed to breakdown they redistribute soil and microbes to decompose the thatch. Make your lawn healthier by reducing soil compaction & thatch. The best defense against weeds is to have a healthy, thick lawn that Aeration and Overseeding can give you. 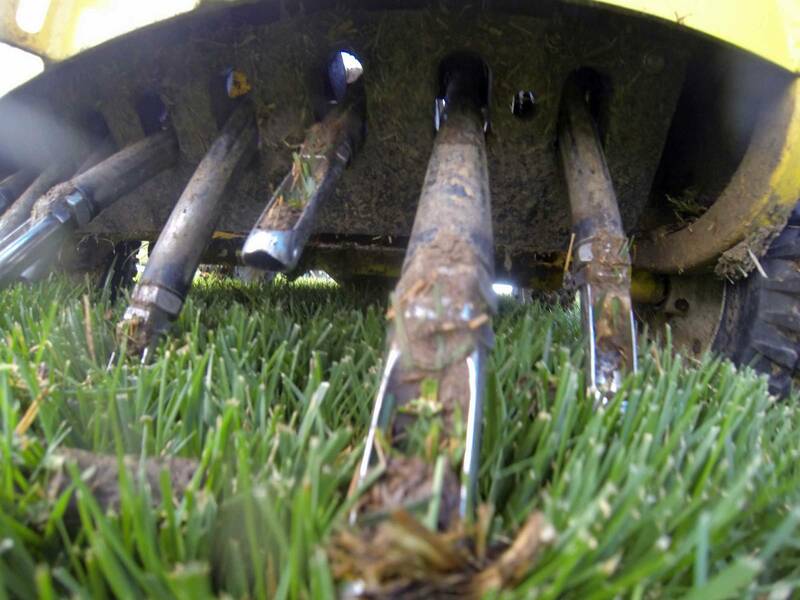 Aeration creates a channel through which oxygen, water, and nutrients can penetrate into the soil which allows new grass roots to spread out. Aeration & Overseeding is one of the most important, but often overlooked, things you can do to improve your lawn. 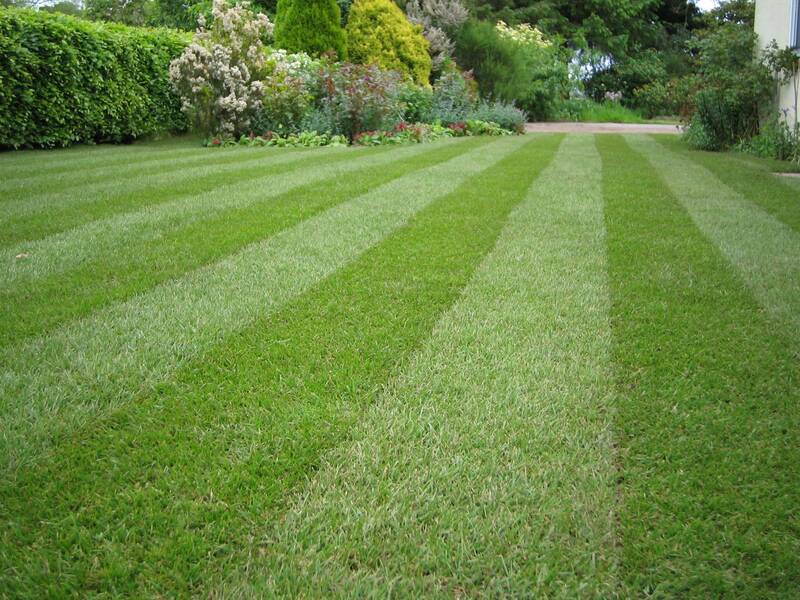 By removing small plugs of grass, soil and thatch, Aeration and then Overseeding with new grass seed, creates a pathway for your lawn to regenerate and grow deeper grass roots giving you a greener, thicker lawn. Before and 8 weeks After Aeration. That's Lawn Rejuvenation. Aeration, in combination with Overseeding, helps make your lawn healthier by reducing soil compaction, creates a channel through which oxygen, water, and nutrients can penetrate into the soil which allows new grass roots to spread out and grow deeper giving you a greener, thicker lawn. Core Aeration removes small plugs of grass, soil and thatch and deposits the core plugs on the surface leaving small holes in the lawn. When the plugs are left on the surface and allowed to breakdown they redistribute soil and microbes throughout the thatch. As the plugs begin to break down, microbes in the plugs will begin decomposing the built-up thatch layer and over time will reduce it. Plugs may appear unsightly for a few days, but they will benefit the lawn, and in a week or two, they should disappear. After Aeration is a perfect time to overseed with new grass seed. Overseeding introduces new grass seed to fill-in thin areas, thicken existing turf and an opportunity to introduce more desirable grass types. The two step process may help reduce problematic weeds that are resistant to weed control without resorting to a complete new lawn install. Crabgrass, nutsedge and broadleaf weeds easily spread to thin areas in an unhealthy lawn. The best defense against weeds is to have a healthy, thick lawn that Aeration and Overseeding can give you. Also, if your lawn was attacked by disease, fungus, insects or animals then Aeration and Overseeding will improve your lawn’s appearance.